I had missed her the previous times she had visited Kansas City. I was not skipping this opportunity. 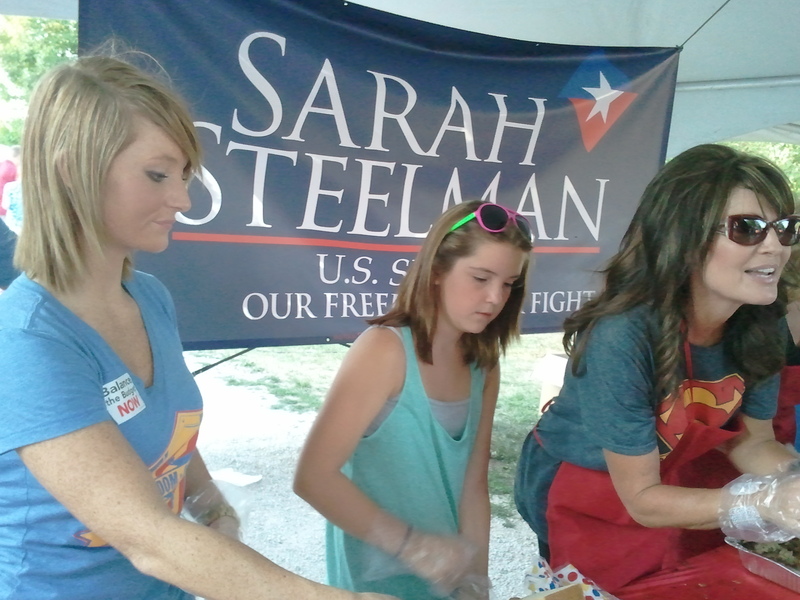 Sarah Palin and her family, Todd, Willow and Piper, were visiting Friday to stump for Sarah Steelman. 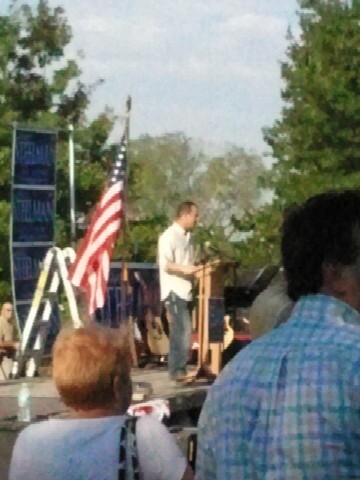 The event took place at The Berry Patch outside Cleveland, MO—the largest Blue Berry farm in the state, Friday evening. We took our friend, Jim W, along. He’s a big Sarah Palin fan. The notice we received said the “gate” would open at 5PM, and the event would start at 6PM with BBQ and music afterward. We arrived early; a bit before 5PM. There was around a hundred people already there, excluding the vans and setup for two local TV stations, and a large truck from the AFP, the Americans For Prosperity. Thirty minutes later the crowd had swelled to several hundred more. I would estimate the crowd to be in excess of 500 people at its peak. The first Sarah Steelman campaign worker we saw was a friend, Jason Smith, a Missouri State Representative from Salem, MO. Jason has visited our church many times and has friends in our area. We talked with Jason for awhile and with Sarah Steelman who had joined us. After we had talked for a few minutes I noticed a large RV parked near some trees. I don’t remember if it was Jason or Sarah who mentioned, “That’s the Palin RV. Todd drove it down from Iowa. Sarah will be flying in to the Executive Airport (Olathe, KS) and then they will take the RV to Sarah’s next event.” It was a really nice RV! At 6PM, Steve Tilley opened the event. Yes, it’s a poor photo. A smartphone camera doesn’t zoom worth a hoot. At least, it’s my photo. Not one I found on the ‘net. 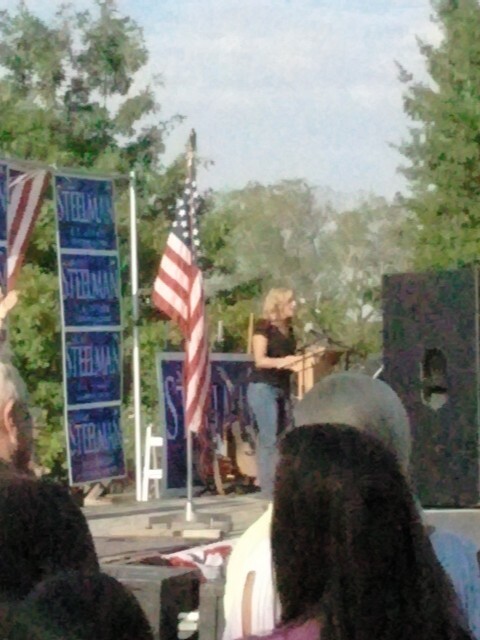 Sarah Steelman was next. She spoke for fifteen to twenty minutes. Sarah Palin landed around 5:30PM at the closest airport and was being driven to the event site. I don’t know if she had arrived yet when Sarah Steelman started speaking. The Finale was Sarah Palin. Her remarks hit the internet, Newsmax and others, before the local TV stations aired her. I don’t know who fed the audio and photos to Newsmax but they were fast! 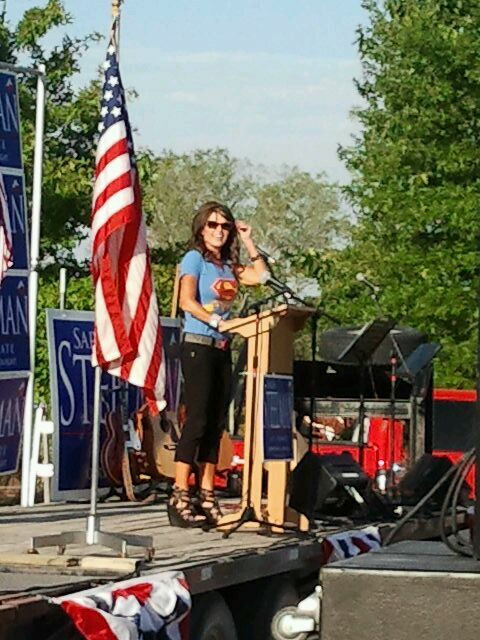 Sarah Palin was wearing a “Super Sarah” t-shirt. I don’t know which Sarah was super—probably both. The local news people put a lot of emphasis on the t-shirt. They seemed to think it was a big deal. The BBQ was from KC Masterpiece. 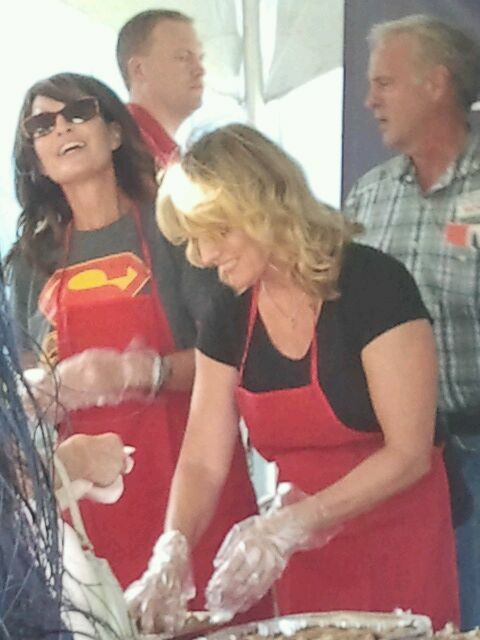 The Two Sarahs served the people along with Sarah Palin’s daughters, Willow and Piper. Our friend, Jim W, took a baseball with him and asked for Sarah Palin’s autograph. She called for Todd and both signed it. The baseball is one Jim caught at a Cardinals game—a foul ball that landed right in his hand. I saw a number of ‘Pub pols at the event. Many took advantage of the photo opportunity while others just wanted to wheel ‘n deal with the establishment. One, who knows I’m voting for his opponent, snubbed me. I thought it was funny and proved my opinion of him. It was a great evening. Too bad it takes an election for such events and gatherings to happen. The election tomorrow will be interesting. The Tea Party has been in the background, working from inside. I wonder if they will surprise the establishment come tomorrow night. I was over at Hot Air when I saw this. This article really made me curious. Iowans might feel a bit overwhelmed by the choices for next Tuesday’s Republican caucuses for the GOP presidential nomination, but one independent group has begun running radio ads insisting that there is still room for one more choice. Calling itself “Sarah Palin’s Iowa Earthquake,” the group will target specific markets in Iowa asking voters to line up behind the Republican Party’s most prominent non-candidate, and other ads will apparently follow. Here’s another source from Breitbart on the same subject. Now wouldn’t that just put a twist in the Establishment’s nickers? Really, I wouldn’t have believed this if someone had told me. As usual, I brought up Drudge this morning and what do I see? The New York Times, known for falsifying and fabricating news, has something positive to say! And—remarkably unbiased. I have always been a Palin fan. I makes me grieve when I hear her bad-mouthed by Ann Coulter, Laura Ingraham and other ‘Pubs. The establishment of both parties fear her; perhaps the ‘Pubs more. Why? Because she has the potential to upset and eliminate the status quo. She does not travel the country with her family, speaking here and there, suddenly appearing at a park, zoo, touring the country and listening to people, just for the fun of it. The “lamestream” media, as she calls it, still has power. Too many still have their opinions formed by the media and the establishment. The proof of that are some polls that says Palin could not win any electoral race. I find that hard to believe. Why do I not believe those polls? Because everywhere Sarah Palin goes, crowds gather. Even in the rain in Indianola, IA, thousands stood in the drizzle and rain to hear her speak. Palin has power. Whether it is as a candidate, or as an issue strategist, when she speaks, the country listens. It’s almost summer. The elections arrive next year. It’s Palin season again. The New York Times and the Washington post have asked readers to examine Palin’s e-mails while she was Governor of Alaska and dig some dirt. The only problem—there’s no dirt! It’s strange the MSM fears someone who is not in office, whose marriage is strong and stable, a mother who refused to kill her Downs Syndrome child, and…has not announced she’s running for office. A private citizen. As Rush Limbaugh often says, “The left will tell you whom they fear.” That, my readers, is a truism. If Sarah Palin decides to run, she will be the front-runner. The media knows that. That is why it is Palin season. Sarah Palin was correct. When stopped, he did warn the British against proceeding to seize the arms and powder at Lexington and other villages. You betcha she was right! Sarah Palin yesterday insisted her claim at the Old North Church last week that Paul Revere “warned the British” during his famed 1775 ride — remarks that Democrats and the media roundly ridiculed — is actually historically accurate. And local historians are backing her up. Patrick Leehey of the Paul Revere House said Revere was probably bluffing his British captors, but reluctantly conceded that it could be construed as Revere warning the British. McConville said he also is not convinced that Palin’s remarks reflect scholarship. “I would call her lucky in her comments,” McConville said. This is just an example why we must win every election come 2012 and then permanently remove these…well you complete that sentence. The Libs will show you whom they fear. The lib MSM is outraged! Again! Sarah Palin won’t give them interviews (except for Fox who pays her—MSM), nor will she give an itinerary for her tour buss. Why, why, some of these young reporters could get killed—CBS. And…and…her red, white and blue bus violates Federal law—MSNBC. It’s farcial. I don’t blame Sarah Palin a bit. If she gives interviews, the MSM will twist her words or lie. Why should she give them anything? She’s doing quite well all by herself. 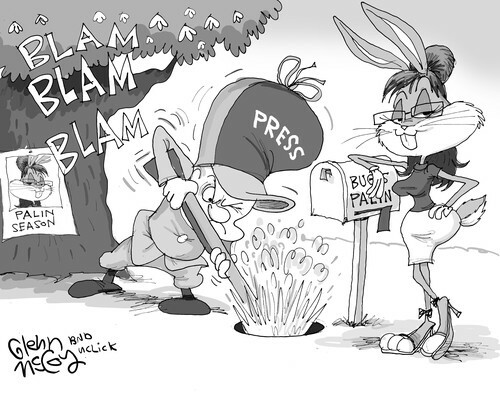 On a parting note, this little bit by Lisa Benson. Little dogs chasing after the Big Dog. My Tahoe is back in my garage. I feel like Linus when his blanket is returned to him. The political sphere is all agasp! Palin is on the road again in her Red-White-Blue tour bus. What does it mean!?!? She’s not saying at the moment. The tour will start with the Rolling Thunder Motorcycle Rally. From there it will travel the east coast visiting historical sites—and meeting folks all along the way. Regardless of the sentiments of the MSM and the ‘Pub establishment, Palin is a money raiser and vote getter. When word began to be leaking that Palin was running for Prez, her poll ratings jumped. Dramatically. Earlier polls placed Palin well down in the pack of potential ‘Pub candidates. Now, when it appears that she is really going to run, she bounces to within two points of Romney, the current leader. Despite all the dissin’ she gets from the establishment of both parties, no one can deny that her name has drawing power. She has my vote. I’d have preferred she ran for Prez the last time instead of that worthless RINO from Arizona. He has a 20-ton Albatross hanging around his neck called Romney care. Yes, he has a business background. Yes, he did well running the Salt Lake City Olympics. But when it came to governing Massachusetts, he revealed his RINO core—then denied it. Let me count the ways. From the Washington Examiner. In December 2009, when the so-called “public option” went down in flames in the U.S. Senate, so too did Romney’s ability to distinguish the structure of his plan from President Obama’s in any meaningful way. Both plans force individuals to purchase insurance under the threat of a penalty, expand Medicaid, and provide subsidies for individuals to purchase government-designed insurance policies on a government run exchange. One of the main architects of the Massachusetts plan, MIT economist Jonathan Gruber, went on to be a paid consultant for Obama and a booster of his health care plan. He recently told the Washington Post’s Jennifer Rubin that Romney’s plan “gave birth” to ObamaCare. The attempt to shift blame to Massachusetts Democrats normally has several iterations. One argument is that Romney used his line-item veto to remove many of the mandates and other objectionable items from the bill, but was overruled by the Democratic legislature. Another is that it fell on Democrats to implement the plan because he left office before the law went into effect, and they messed it up. Neither of these arguments stands up to much scrutiny. Trying to deflect criticism by pointing to flawed implementation is an even weaker argument. To start, the version of the health care law that he signed had the key features that have drawn the most criticism. Beyond that, Romney announced he wouldn’t seek reelection in December 2005 – months before he signed the health care law. Thus, he signed it knowing full well that he wouldn’t be there to implement it, and that it would almost definitely fall on a Democratic successor. If it was so important to him that the health care law be implemented properly, he should have sought reelection. This argument, a close relative of the blaming Democrats defense, suggests that given the overwhelmingly liberal legislature, he got as good a deal as could be hoped for. This is a bizarre argument for Romney defenders to advance for several reasons. To start with, it’s not as if, sometime in the spring of 2006, the Democratic legislature plopped down a health care plan in front of him and Romney had the option of either signing it, or getting what he could in exchange for his support. By Romney’s own account in the WSJ op-ed, he decided to take on health care after the CEO of Staples urged him to do so weeks after he was elected in November 2002, and soon he “assembled a team from business, academia and government.” In other words, this was to be his main legislative ambition in office, something that he spent years developing. Once it was obvious that the end result would be a liberal, government-dominated plan, he could have decided that it was no longer worth doing. But he ploughed ahead anyway. GIBSON: But Government Romney’s system has mandates in Massachusetts, although you backed away from mandates on a national basis. ROMNEY: No, no, I like mandates. The mandates work. The bottom line: Political analysts keep saying that Romney will have to find a way to address the health care issue. But the reality is, he has no coherent defense to offer and it’s too late to disavow the law. As I’ve written before, Romney’s only hope is to simply survive the issue by attrition, hoping that the primary electorate’s attention is diverted elsewhere and that no viable alternative candidate emerges. Needless to say, Mitt Romney can’t be trusted. When examining candidates like Romney, we must realize that what is said, counts little compared to what has been done.